We traditionally consider the pathway from health to death to be mediated by the occurrence of disease. This research seeks to expand on this model by examining the role of frailty in promoting disease and death. 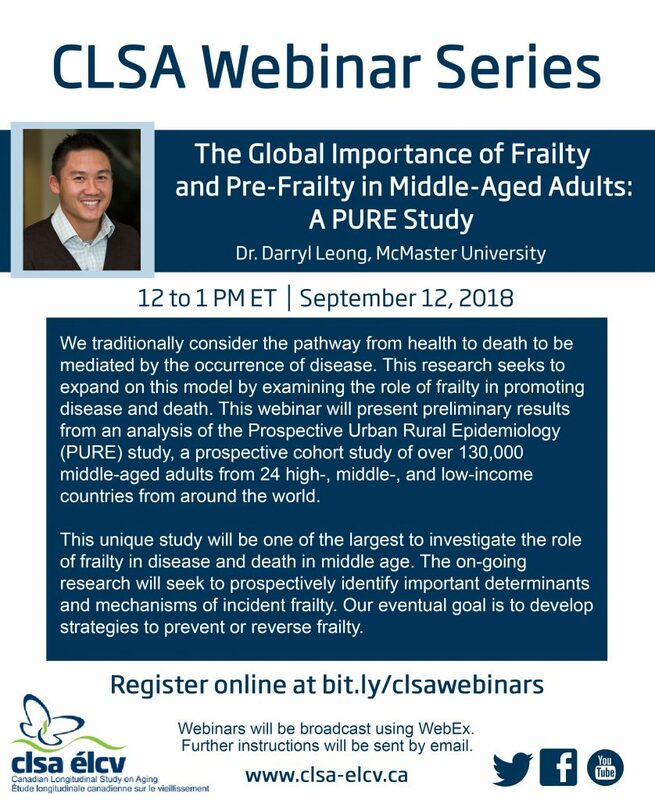 This webinar will present preliminary results from an analysis of the Prospective Urban Rural Epidemiology (PURE) study, a prospective cohort study of over 130,000 middle-aged adults from 24 high-, middle-, and low-income countries from around the world. This unique study will be one of the largest to investigate the role of frailty in disease and death in middle age. This ongoing research will seek to prospectively identify important determinants and mechanisms of incident frailty. Our eventual goal is to develop strategies to prevent or reverse frailty.